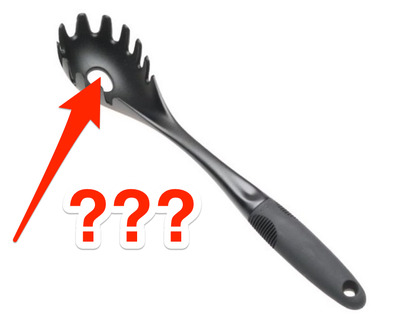 You know those spaghetti spoons (perhaps more accurately described as a spork?) that are used to stir and serve pasta noodles? Everyone’s got one in their kitchen drawer. Turns out it’s got a really simple and smart use. The hole can be used to measure out approximately one serving of spaghetti. However many dry noodles fit into that hole count as a single serving. 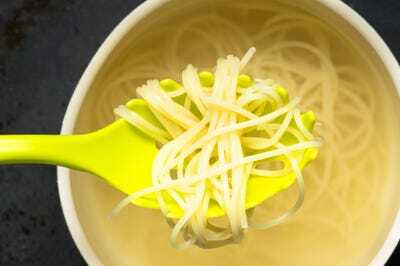 So instead of simply throwing a bunch of spaghetti noodles into a boiling pot of water and hoping it’s enough (or not too much) you can now be sure you’re cooking the right amount all thanks to this handy hole. Some fancy spaghetti spoons even have multiple holes for multiple different portion sizes. Unfortunately, this method doesn’t work for pasta noodles other than spaghetti, though. If you’re making Farfalle, you’ll have to come up with your own creative method for measuring out a serving size. Now that your mind is blown and you’re craving spaghetti, go rush home to your spaghetti spoon — or buy one — and use it how it’s supposed to be used!